After countless hours of research, here’s Photophique’s guide to the 6 best Sony E-mount lenses currently available. Lens options were initially limited, but Sony and other lens manufacturers have been continually introducing new models. Sony has been the top mirrorless camera manufacturer ever since their a6000 APS-C camera was released. The small cameras have become a favorite for travel photographers and anyone looking to decrease the size & weight of their kit. Most E-mount cameras don’t feature image stabilization, but the a6500 was the first to introduce in-camera stabilization. As a result of this, every lens in this list features built-in Optical SteadyShot. Sony E-mount cameras don’t feature weather sealing, and the lenses don’t either. This is something to take into consideration when you’re looking at a camera system. Finally, these lenses aren’t just for APS-C E-mount cameras. They’ll also work well with the Sony full frame E-mount cameras. In fact, the 10-18mm lens on this list is one of the most popular wide zooms for full-frame cameras. The crop factor still applies when mounted on these cameras, otherwise you’ll get extreme vignetting. For those with the budget, the Vario-Tessar 16-70mm f/4 is a great option for photographers who just want one good everyday lens to leave on their camera. The focal length works great for landscapes, portraits, street photography, and capturing distant objects. Optical SteadyShot compliments a maximum aperture of f/4, constant throughout the zoom range. A seven-blade circular diaphragm will produce smooth bokeh for your portraits and still-life photography. Sony has built in five specialty lens elements to reduce aberrations and distortions, all featuring Zeiss anti-reflective coating. Color rendition is great, as is the contrast. If you’re having a difficult time justifying the price though, you may want to take a look at the more affordable 18-105mm f/4. The 16-70mm is easily more expensive than some of the actual camera bodies that will take it. Reviewers all have great things to say about the focal length of this lens. It’s perfect for travel and is one of those lenses that you can probably leave on your camera 90% of the time. There does seem to be a consensus that there is a dramatic falloff in sharpness around the edges. You’ll notice this if you zoom in on the photo, otherwise it shouldn’t be a nuisance. Some batches of this lens had some quality control problems where one side of the frame is blurry. These should mostly be phased out by now. You may have to correct purple fringing in post-processing. Some high-contrast scenes exhibit this unwanted phenomenon around the edges of the photo. Otherwise, this lens produces outstanding, rich colors, and clear photos. Sony’s great Optical SteadyShot system is a wonderful addition to this lens, seeing as not many Sony APS-C cameras feature this in their sensors. The maximum aperture of f/4 also begs for this feature. You’ll also find the legendary Zeiss anti-reflective coating on all elements of this lens. This technology reduces glare and increases the clarity, and you will notice a difference. All zooming and focusing functions are internal to the lens. This keeps the barrel the same size and speeds up the focus. The minimum focus distance is 13.8”. You’ll notice the outstanding build quality of this lens when you hold it in your hand. It’s a very solid lens and you’ll get plenty of service out of it. Sony might slightly mislead some customers by slapping Zeiss on this lens. It’s not made in Germany, and not all elements are Zeiss. It’s only the coating that is Zeiss, and buyers should be aware of this. A price drop would definitely help sell more of these lenses. While it is better than the kit lens, it’s not a premium, fast lens that may warrant a premium price of nearly $1000. Buying a used lens may be the way to go. The focus and zoom rings on this lens are touching each other, and this has tripped up more than one photographer. Moving them further apart and offering some tactile differences could solve this problem. 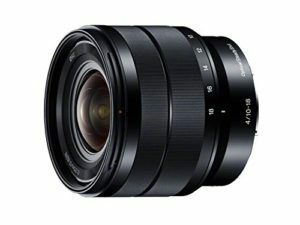 The best wide-angle zoom for Sony E-mount is the 10-18mm f/4 OSS. This lens is so popular for Sony’s APS-C cameras that it’s also a favorite wide zoom for full-frame users as well. The lens is mostly made of plastic so it has a fragile feel to it, but construction is superb. Optical quality is also top-notch, and pixel peepers will find few flaws when they zoom in on their images. Sharpness starts to taper off approaching maximum and minimum apertures, but this holds true for all zooms. A constant aperture of f/4 keeps this lens smaller than its faster counterparts. This is an extremely compact & light lens that will take up next to no room in your camera bag. But if you love it like everyone else, it will probably be on your camera most of the time. When Sony NEX photographers only own two lenses, this is most often-used one of the two lenses. It’s sharp throughout the zoom range and produces clear, crisp images. The super-wide range is great for landscapes, real estate, and architecture. Super wide lenses aren’t for everyone though. Those who have used this lens would caution others to avoid distortion by paying particular attention to their composition, subject distance, and lines. YouTube Vloggers also have great things to say about this lens. The wide angle enables a great perspective, and the lens is so small and light that it works very well with a gimbal or stabilizer. 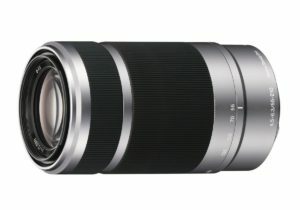 The only “wish list” item from other photographers is for this lens is to have a slightly larger zoom range. The 10-18mm lens features a constant aperture of f/4 throughout the zoom range. To make up for this relatively slow speed, this lens is equipped with Optical SteadyShot for assisting slower shutter speeds. Focus is fast and accurate, using a linear motor and internal focus mechanism. You can focus as close as 9.8” with this lens. Zoom is also internal to the lens, so it will maintain a constant size. This lens is expensive but you’ll get outstanding quality with it. Three aspherical elements reduce aberrations and distortion. You may find some distortion especially at the wide end, but this can be taken care of in post-processing. Fringing is kept to a minimum. This is already a wonderful lens and there isn’t much that Sony can do to improve upon it. 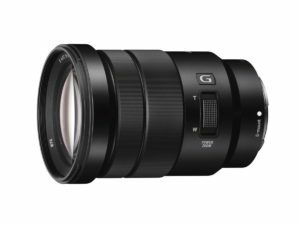 Sony does know that they have an excellent super-wide zoom with this lens, and they’re charging more than some people may want to pay for it. For a lens of this price you’d expect to see a few extra features. Weather sealing is one of them, though Sony doesn’t add this to their E-mount bodies. A faster aperture would definitely make the price easier to justify, but then you’ll have a larger and heavier lens. A larger zoom range would also help ease sticker shock. The 55-210mm f/4.5-6.3 OSS lens is one of the kit options offered with Sony APS-C cameras – and it’s a much better value when purchased as a kit. There aren’t many telephoto zoom options for E-mount cameras, especially affordable ones. For photographers on a tight budget who want a decent zoom, this is a great option. The small size and weight of this lens is rather exceptional given the large zoom range. Even though the lens is small for a telephoto of this range, it still does look large when mounted on the small APS-C camera bodies. If you’re making money with your photography, it might be worth looking at a more expensive telephoto zoom like the G Master lenses, or the shorter 18-105mm. While this lens produces great images for everyday shooting and serious hobbyists, there is an amount of softness and chromatic aberrations that may not be acceptable for professionals. This lens doesn’t get as much credit as it deserves. Photographers who love it, love it. There are other photographers though who expect to get premium lens performance out of a lens with an expansive zoom range for under $350. The quality for the price is important to consider. The slow, variable aperture means that this lens isn’t great for sports photography, and low-light performance is fairly dismal as well. But in bright light the focus is fast and accurate, and the images start to pop. The minimum focal range has tripped up some photographers. Mounted on an APS-C camera, this lens has a minimum focal length of 82.5mm. This is going to get you in tight, so be ready for it. It will still work for portraits, but only if you keep your distance. Quality is perfectly acceptable if you’re not zooming in to 100% – but how many of us find ourselves doing that, anyway? Optical SteadyShot is a necessity on a lens with this kind of focal length, either in the camera or in the lens. This lens includes OSS because not all E-mount cameras have stabilized sensors. The system works well and will give you four stops of stabilization. The internal focusing system is extremely smooth and silent, and also very fast in the right lighting conditions. Zoom is also internal to the barrel, and the camera holds the zoom setting when power is cycled. This lens features surprisingly solid construction given the price. It’s mostly plastic, but it’s not the kind of plastic construction that will give you pause, as you see in other off-brand cheap lenses. All things taken into consideration, this lens is a great value for what you’ll pay. All of the improvements that could be made to this lens would make it more expensive, and the low price is one of its strong points. One of the things that could be improved without adding too much to the price would be the addition of a tripod collar. The lens isn’t very long, but it’s just long enough that it doesn’t balance well on a tripod when mounted to the camera. The minimum focus distance of 3.3’ is also somewhat disappointing. Better control of fringing in high-contrast scenes, especially when zoomed, would make this lens so much better. In some situations the fringing and aberrations can’t be negated with post-processing. The PZ in the name of the PZ 18-105mm G stands for ‘Power Zoom,’ and that indicates that this lens was designed with recording video in mind. The focal range is extremely useful for video shooting, and a favorite for travel photographers. This lens does come with some distortion. You’ll need to check firmware compatibility before using this with some E-mount cameras or else you’ll be in for a surprise. Optical and build quality is great in this G lens. The constant aperture of f/4 throughout the zoom range is another advantage for video shooters, and still photographers will love having that kind of speed at maximum zoom. A minimum focus distance of 1.5’ may not seem close, but it’s a great design compromise for a lens like this. Overall, this lens is a great value for the price. Images coming out of the 18-105mm G are clear and sharp, as are the videos. The lens does have a touchy manual focus ring. Feedback isn’t immediate because it’s connected to the focus motor, and a small input makes a large adjustment. Some photographers have had troubles overshooting their desired focus. Quickly zooming the lens can create some focus problems as well. The lens seems to have a difficult time holding the focus point, and will end up hunting for that focus once the zoom is complete. Photographers shooting stills also have great things to say about this lens. The front element is on the large side, but the focal range makes it a great lens to keep on your camera all day long. The Power Zoom featured in this lens is the same zoom used in Sony’s acclaimed Handycam video cameras. This lens can zoom quickly and quietly, just with the push of a small button on the barrel. Full zoom control is also available with the large zoom ring. Optical SteadyShot assists with stabilizing both handheld still photos and handheld video. It provides up to four stops of stabilization. Despite this lens being mostly plastic, the build quality is far superior to most plastic lenses. The price is just right, especially considering you get image stabilization and a constant aperture of f/4. This lens could be much better if low light performance was improved. It’s slow to focus and may sometimes entirely miss the focus point. One little annoyance for a lot of photographers is when lenses reset their focus & zoom settings when power is cycled to the camera. Some of Sony’s lenses hold their previous settings; the 18-105mm G will reset settings between cycles. This lens also lacks any effective anti-reflective coatings. You may see some flaring and ghosting when the lens is pointed towards the sun, even with the lens hood attached. Finally, a simple improvement would be to include a focal range indicator on the barrel. It’s surprising that this lens lacks something like that. The smallest & lightest lens on this list is the 35mm f/1.8 prime. It truly will fit in your pocket, and you won’t notice the weight of under a quarter of a pound. The size and weight is truly incredible for a lens of this speed. You may have heard that every photographer needs a “nifty fifty” in their kit. This is that lens, having an equivalent focal length of 52.5mm. Sony has packed a lot of features into this lens. Other than the fast aperture, it also contains Optical SteadyShot. Three specialized lens elements reduce aberrations and fringing while increasing contrast and clarity. The images really pop. This is the most popular prime for Sony APS-C cameras. Many photographers who only own one prime lens choose this as that one lens. It’s often the first lens that Sony APS-C shooters purchase after using only the kit lens. It’s a very sharp lens and is great for portraits. Photographers have noticed quite a bit of fringing when shooting against bright backgrounds and at wide open apertures, but the fringing drastically decreases when stopped down towards f/2.8. The focus speed isn’t anything to write home about. It’s not particularly fast but it’s not slow either. However, it does struggle somewhat in scenes with low contrast and low light. Other than that, it does take great pictures in low light thanks to the fast aperture and image stabilization. This lens isn’t just a portrait lens. It handles continuous autofocus very well, which makes it a strong contender as a video lens. It’s also perfect for gimbal use, given its small size and weight. You’ll really be able to isolate your subject with the fast aperture. The circular seven-bladed diaphragm produces some very smooth bokeh. A minimum focus distance of 11.8” will also get you close to still-life subjects, but be careful with your focus when shooting this close at f/1.8. Other than some slower focus in low light, this lens is perfect for those situations. The combination of Optical SteadyShot and a fast aperture of f/1.8 make this lens a great choice for shooting in dark environments like night cityscapes and events. Like many other Sony lenses, this one is viewed as a bit-overpriced for what you get. It’s a great lens, but you’re just going to pay more for it due to the lack of options for Sony E-mount primes. Despite the solid build, the lens feels cheaply made. It’s constructed with a mix of plastic and metal, but still has a “loose” feel. 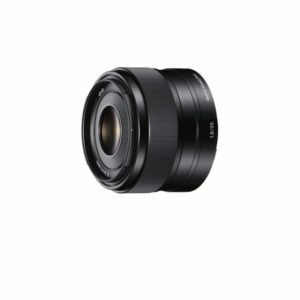 For the price Sony should at least give photographers some more confidence in the lens construction. It’s unclear whether Sony intends to start making all future APS-C cameras with weather sealing. Being proactive with weather-sealed lenses would really put them in the good graces of Sony photographers, especially considering they’re already charging a little extra for their lenses. 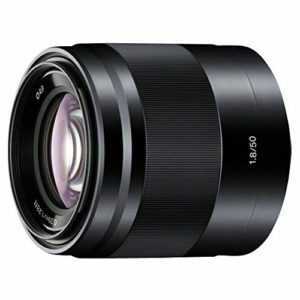 The Sony E 50mm f/1.8 OSS is a slightly cheaper prime lens option than the 35mm f/1.8. 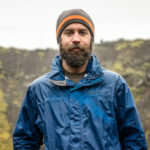 The framing is going to be tighter, but the equivalent focal length of 75mm is still a popular length for portrait photography. The focal length is just a little too long to make this a lens you’d leave on your camera all day while wandering around the city. You’ll have to be deliberate with your photography when you have this lens mounted to the camera. There are no complaints about sharpness or fringing on this lens. The optics are wonderful and the bokeh is what you’d expect out of a more expensive lens. Optical SteadyShot will give you up to four stops of stabilization. The minimum focus distance of 1.3’ also makes this lens an option for macro work. This lens isn’t just used by portrait photographers. A number of other photographers also love this lens for candid street photography, macro photography, and product photography. A number of reviewers point out one operational consideration that’s worth mentioning here. The equivalent focal length of 75mm, combined with a wide aperture of f/1.8, means that you’ll have to be very careful with your focus. The depth of field can be extremely shallow and make you miss your shot if you’re not careful. The manual focus-by-wire can be difficult to get used to. The focus ring has a lot of spin in it. It’s designed this way to give you precision manual focus control, but it can take longer to get to your focus distance. The adjustments aren’t immediately visible either, so be patient with it. This lens has some outstanding optical quality, which is even more impressive given the affordable price. Images are sharp from corner to corner at all apertures. Distortion, fringing, and aberrations are barely noticeable as well. And Optical SteadyShot will really help you get that shutter speed down without having blurry photos. Construction quality is also what you’d find on more expensive lenses. It doesn’t feature weather sealing and the black finish is prone to rubbing off the metal. But other than that, you can be confident that it won’t break easily. Images with extremely shallow depth of field will have a wonderful, professional look to them. This lens features a circular seven-blade diaphragm, producing smooth & creamy backgrounds. Autofocus speed is slower than most other Sony lenses, especially in low light. This lens features internal focus like the other lenses, but it has a tendency to hunt around for the focus point. The focus motor also seems to be louder on this lens. If you plan on shooting any video, you’ll need to use an external microphone and keep it away from the lens. Otherwise you’ll end up with the whine of the motor in your video. Be careful with the lens hood. It doesn’t mount as securely as it could and has a tendency to pop off.